My time before my retirement from the military was just months away, so I wrote to the Atlas Chemical Industries (Power Company) for employment information. I received a reply, dated 2 Feb 1968, that they would have a plant opening for a guard later in the year and I should come for an expense paid interview. The military agreed to let me have time off for the interview, but I felt Atlas had made a mistake. I wrote them again, saying I had the time off and would come for the interview, but I thought they should know that APO NY 09221 was located in Italy. On 13 Feb, I received a letter from them saying that they thought I was located in the southern part of the US, so it would be impractical to consider me for the job. They would keep my application on file and contact me if another opening occurred. 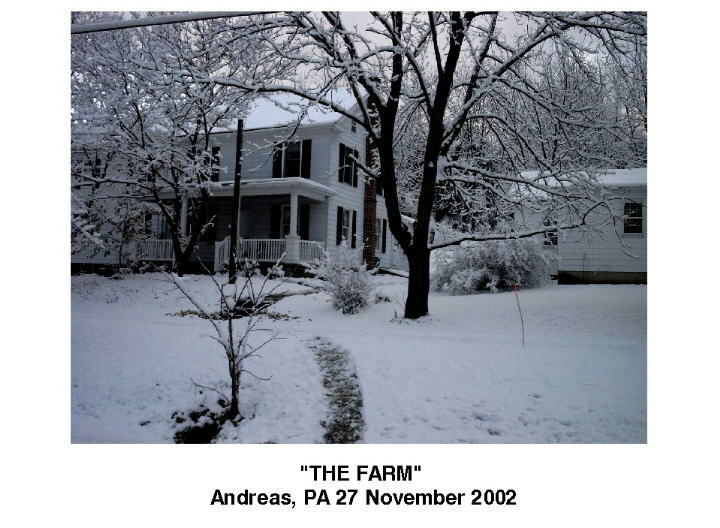 I retired and started to settle in on the farm at Andreas, Pa. We had purchased it while we were at Fort Ritchie. It had been owned by my father's sister and her husband. They had passed away and we bought it. We had been paying for a home in Waynesboro, Pa and now we were the proud owners of two mortgages. It had 68 acres and later on we would add another 5 acres. No plumbing, electricity, or central heat, but we had a well, septic system, and electricity brought in to the cellar previously. There were no interviews scheduled at Atlas, but I kept in touch. We were headed to Virginia for a visit, because we were assured there were not to be any interviews. We were between Snyders and New Ringgold, when we were stopped by a friend, Irma, in her car. She had gotten information that there would be interviews the coming week, and knowing that we would be going to Virginia, tried to call by phone. There was no answer, so she knew we had started out. When our car passed her house in Snyders, she jumped in her car, house coat and all. If she hadn't done what she did, I would have missed my chance for employment. I am grateful to her to this day for her concern. I had my interview and they told me that all they had open was labor jobs, and I was over-qualified for them. They would keep in touch with me. I told them that I wanted the labor job, but they said I wouldn't be able to take the kind of orders demanded. I told them that everyone in the military takes orders from someone else, regardless of rank. I talked them into giving me the job. The job was manual labor and dirty, but each morning I showed up with clean work clothes, shined shoes, and a good attitude. I unloaded box cars, trailers, swept warehouses, cleaned streets, laid small gauge rail track, and worked the powder houses. I went home tired and crummy, but showed up the next day clean and fresh. I took electronic training under the GI Bill and when I completed a course, a copy went to personnel. One day the assistant personnel manager said he thought I was looking for advancement and just what job was I looking for? I told him any advancement; maybe his, so he should be careful. As I was unloading a box car one day, I was told to report to the industrial engineering office. I had no idea what it was all about, until the foreman told me that I was having an interview with the department head. It was my lucky day. I was put on 3 months probation, as an industrial engineering technician, on salary. It was interesting work and the five other engineers there picked me up by the boot straps and I was on my way. Help was every where for the asking. It could be the comptrollers office, powderline office, or any other departments, everyone responded. The three months probation passed and I was made permanent. I had been on the labor gang about a month before I made that big step. Every year I received the incentive pay salary boost and in 1973 I was promoted to Junior industrial engineer. I came up with many different ideas for cost savings. 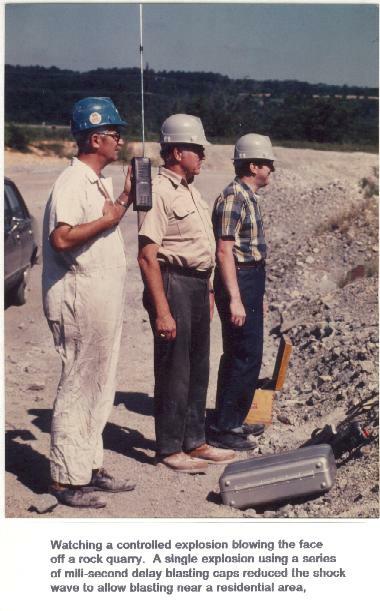 The best one was: every delay blasting cap had a tube in the cap, which was filled with the delay powder. All these tubes were machined on screw machines and it was difficult to hold the tolerances for any length of time. 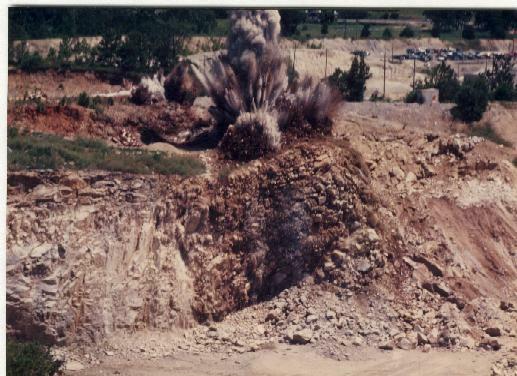 That resulted in more test firings, etc. It all added more cost to the product. Also, there were copper and aluminum caps and each one had to have a tube made of a compatible material. Through reading, I found a firm who did investment castings. The castings would maintain the same specifications and there was a possibility that zinc could be used in either cap. I dug in and everyone had their smile. There had been a trial machining zinc in the past, but it hadn't been carried far enough. As the story goes, "The dumber the farmer, the bigger the crop". I was the farmer, but I was given the go ahead. My venture was successful and the costly screw machines were used for a few longer delays, which weren't sold in volume and the initial molds would not have been cost saving. The savings amounted to about $35,000 a year and that figure would grow, depending on production. 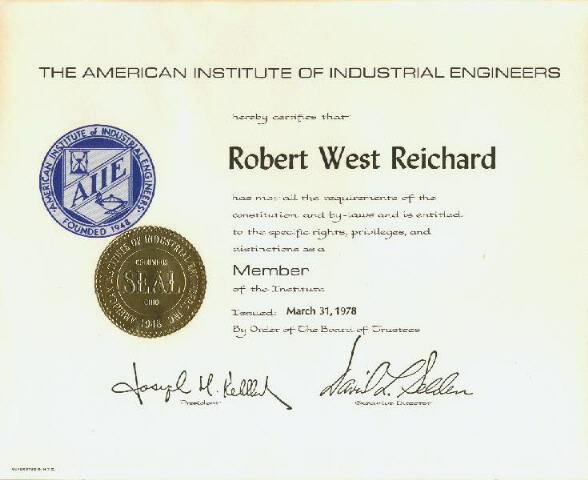 In 1980 I was promoted to Industrial Engineer and through my boss, Fred Oswald, I gained full membership in the American Institute of Industrial Engineers. It was a big day. The bad day arrived on 18 June 1982. We had been working part time in the department, but this day two of us lost our jobs. The plant manager came by to say he was sorry, but we would be eligible for unemployment. Not so, as a retired soldier I was not eligible for unemployment, even though I now had fourteen years of work behind me. The people in personnel checked and found out I was right. I hadn't been scheduled to work the following week, so it looked as if I wasn't going to get an extra weeks pay. Since I wasn't to work the following week they decided to terminate me at the end of the present week. I'm not one to go down without a fight, so I brought it to the attention of the plant manager. He asked my boss if he had enough work for me and he said he did. "Wait a minute,"says I, "that doesn't suit me". The manager asked what I wanted and I requested a week at home as a consultant, available by phone. Believe it or not, that's how I got my extra weeks pay. I had put every cent that I could afford in the company's savings program and now that was in jeopardy, because the company's policy was to convert the stock to cash, and in doing so the IRS payment would hurt. I told them I wanted my savings in stock and at that time it was low, so I knew if it was cashed I'd take a double hit. I found the IRS 800 number and they told me I could transfer it intact, and could save paying taxes at that time. I turned it over to an investment firm and several years later turned the stock into cash at three times the value it had been. I was out a job again and much older. I tried several places in the local vicinity and got a job at the Lehighton Electronics Company. I was there for about four years and it was as great a disaster as the 69th Ordnance had been, but they wouldn't let me help. I left in 1986 when my father died at the ripe old age of 98 years, 3 months. I was with the 88th military police company in North Korea in December 1950. The Chinese came into North Korea to help the North Korean Army annihilate the UN Forces there. We escaped by way of Hungnam Harbor and the help of the Japanese merchant marine and their ships. Christmas Day 1950 we were headed south on the Sea of Japan. We landed at Ulsan, South Korea. For a time we policed the port and then we headed north again as our lines moved forward. Kwang-ju would be our next stop and it was there that I met a Korean schoolboy by the name of Joon Bum Lee. (Below, in an email, Lee is correct when saying we actually met in Ulsan. Time had dimmed my memory.) He wanted to learn English and he would do odd jobs for us as payment. He went to Korean farmers and found fresh eggs for us and took our clothing to be washed. I helped him, but I was send forward to move up behind the lines. We never met again during the Korean Conflict. I had given him my parent's address and through that we connected again. I was still in the army moving around, so my parents passed on his letters. Mom sent him some money and he would send them a gift from time to time. Joon moved forward in life. He entered the Korean Air Force and became an officer. He married and had a child. As time went by my parents moved from Lansford, PA to a farm near Lehighton. The letters were forwarded and they kept in touch. In 1962 I was sent to Korea and joined the 55th MP Company. I was sent north to take charge of Detachment #1, which was with I Corps Artillery. In the meantime Joon had completed his military service and was working in commercial industry. He found that I was in Korea again and visited me at Camp Saint Barbara. He invited me to his father-in-laws home located in the outskirts of Seoul. The army let me have a Jeep and Interpreter and I visited with him. He knew I liked shrimp, so the dinner was mainly huge shrimp from off Inchon Harbor. I was the guest of honor so I sat on the white cushion. I completed my tour in Korea and headed to other Army assignments. In 1963 my mother died and I was transferred to Italy. In 1968 I retired from the US Army. My wife and I settled on a farm near Andreas, PA. The home was rundown so there was a lot of work to have done. Joyce found a job teaching and I went to work for the Atlas Powder Company. The post office no longer forwarded Joon's letters to Dad, because a year had passed and the change of address ran out. Our work, and the work needed getting the farm livable took most of our time. Dad died in 1986 and we sold his farm. After that things settled down and I thought about Joon when I salvaged some of his letters and pictures from Dad's farm before it was sold. On 11 March 1993, I sent a letter, with his pictures and the return address he had during his time in school and in the military to the Korean Embassy in Washington, DC, asking their help in locating Joon. I told them of my military service in Korea. I never received a reply. In 2000, I was connected with (Paul) a Korean/American US Navy Seal who was looking for his GI father. I sent him pictures and information to help him as he kept up his quest. He had a lot of contacts, so I asked him for help in locating Joon. He passed on the information I had sent him and I waited without much hope of success, because Joon would be in his 60's, which was close to the actuary tables of the Korean male. Yesterday, 2 Feb 01, Paul e-mailed me that a friend of his had talked with Joon, but he needed some information from me that he could use in verifying their contact. I immediately told him times dates and places that only Joon would know. Several weeks ago Paul e-mailed me that he thought a friend of his had located Lee, but after several weeks passed I thought that it was a dead end. It has been long time. I was very surprised that you were looking for me. I also tried to contact you several times.but It didn't make. Anyway now I found you. I'd like to meet you as soon as possible. It didn't take me long to get an e-mail on its way back to Lee. It truly is a small, small world. This is to let you know that I received all four messages from you. Hearing from you made me very happy. It has been a long, long time since we had contact. I had almost given up. As soon as I get a reply from you I will send a long, long message to try to bring you up to date. I think it must have been the US Navy Seal, Korean-American man, who was able to get through to you by means of some of his friends. I will tell you more about that too. My Mother died in 1963 and Dad died in 1986. I am anxiously waiting for your reply to make sure this message has gotten to you. Returned from office I received your letter. surely I received your first letter now. I am very Happy to contact to you again. Also I have had send to you a letter to lansford,penna.in middle of 1960 years. But I coudn't received your letter anymore . So I give up to contact to you. I am working in the field of Adhesive since 1962. Almost 40 years for working in only one field as a research and development sections. During the time, I went to the Japan Adhesive Institue over one years for study and work Japanes Adhesive Company in OSAKA. Now my Company office and Factory is in Seoul (Adhesive maker) and I am always reside in factory. Let us lettering frequently each other. I am very very lucky to contact to you. Lee it is great to make contact with you too. There is so much to put on paper that I will do it a little at a time. I think it was a friend of a US Navy Seal who made contact with you. You see, at this point I don't know how the contact was made. There were two people trying to find you for me. There also you can read about my time in World War II when I flew out of Italy. Near the bottom of the page with my picture are the words "Morning Call" and if you click on that you will go to the newspaper web site. There you will see 20 pictures. If you click your mouse on a picture, that person's War Story of the last century will appear. My picture is in the bottom row and it is the second one in from the left. If you click on that you will read my story about my time in North Korea in 1950. I belong to the "Chosin Few" veterans of that great battle. Note: The "Morning Call" story is now located at this link. I want to know more about your family. The number of children you have and their ages, etc. You know it has been a long, long time. I married a school teacher when I was stationed in Virginia named Joyce. In 1968 I retired from the Army. I won't got into my military moves, because if you go to the bottom of my page on the web site and click on my "Coat of Arms" you will be able to read about my entire military history. Lee I can send out attachments by e-mail in the .jpg format. Will you be able to open the pictures and documents that I will send that way? If so I will be able to send you pictures. I was very happy to get your reply to my first e-mail, so now I know we are connected. I will be looking forward to your e-mails. Thank you. I received your second letter. and I saw the picture of you. behind is your nation flag. and 456 th Bomb Group Association history File: The Stories of Robert W. Reichard. It is not changed your face compared 50 years before, We saw first at Ulsan near the kyungjoo old historical ancient city. do you remember? at that time we were say good-bye because your army (MP ?) moving to the Kyungjoo city , north of Ulsan. Second time was met at Camp Santa Barbara near the North of Seoul. 3th was my father inlaw house. do you remember? of cause father inlaw died in 1970. Wife. mother inlaw. two daughter and one son. first daughter marriaged second -------- single. she is now get job working in the field of fashion. son is now in vancouver Canada. he get job there in intrnet company ( internet interWorld). Now I live with mother inlaw and 2nd daughter,and wife My father died in 1989 and mother died in 1975. my father was a pastor and founded theologcal seminary in 1946 and now became to KANGNAM UNIVERSITY near the Seoul and Students is now over 7000. and I am obtained a seat on the board of directors of University in 1998. So, after 36 years Lee and I are enjoying each others Friendship once again. I am almost 77 years old, so maybe we will have a few more years to go over old times. I am an old high school classmate of Jun-Bum Lee who has known you since the days of the Korean War. I have learned that you have written a letter to the Korean Embassy in 1993 to solicit help to locate Jun-Bum. I am sorry that you have not received a reply; however, I am delighted that you two have reestablished a contact more recently. I had served as the Korean ambassador in Washington between May 1998 and July 2000. Last year marked 50th anniversary of the Korean War, and the commemorative medals were distributed thoughout the Korean War Veteran's Association. You might contact the local association and make an inquiry. In any case, I am extremely happy that you and Jun-Bum has found each other and made the long friendship to go on.